The now-defunct Studio 54 in NYC was formerly a world-famous, exclusive nightclub and disco from the 1970s that was favored by celebrities. Entrance were only admitted for those in style. Today, its golden times can only be witnessed in photographs. 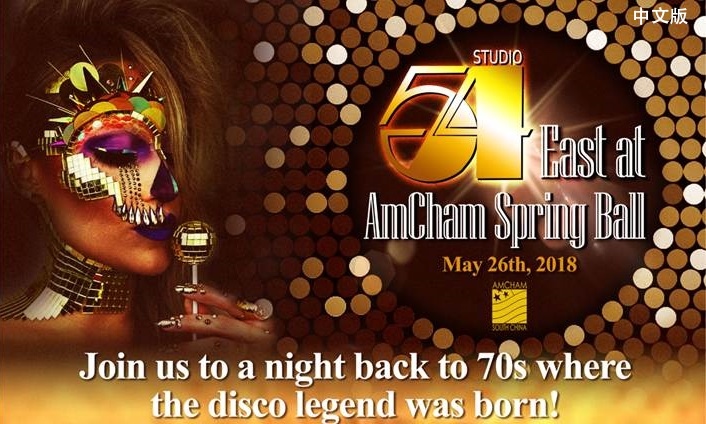 But, in this May, AmCham South China’s spring ball will bring the legend of Studio 54 to town with a night filled with disco, confetti and extravaganza. For tickets, contact Ms. Wing Xian/ Joyce Hu at wxian@amcham-southchina.org / jhu@amcham-southchina.org or 8335 1476 ext. 12 / 20.